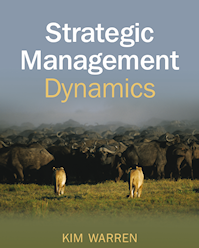 Strategic Management Dynamics is a full-scale textbook on the strategy dynamics approach, with ten chapters building up all the elements you need to carry out a complete strategy analysis on a business or other kind of organisation. Each chapter includes any necessary theoretical background and useful connections with conventional strategy frameworks. The first four chapters provide the core elements of the framework as they apply to just about any organisation, and remaining chapters add important extensions to that core. It turns out many of those frameworks are very useful on their own, as well as when they are included in a wider strategy model of a business. Being so substantial, Strategic Management Dynamics is a solid textbook for an in-depth course, and a reference book for professional analysts who need to master the method. A much slimmer e-book, Strategy Dynamics Essentials, summarises the same content in the same structure, for those who do not need all the detail. This textbook can be purchased through the normal channels – a few common links are shown below.